Logset’s new giant hybrid-electric harvester, the Logset 12H GTE Hybrid, is now reaching the market. They are now sold in Finland, France and other European countries. In Sweden the first hybrid harvester was delivered at the beginning of December 2016. Earlier this year I met the owner, Gerhard Sjölander, who runs the contracting company Quickwood AB. 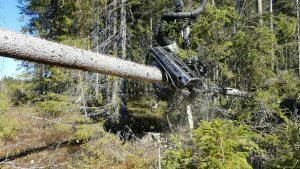 He was doing some final felling for the forest products company SCA, which has vast forest holdings in northern Sweden. At almost 6.5 million acres, it is the largest private forest holding in Europe. I went to the province of Ångermanland to film him and ask him how the hybrid machine has behaved to date. You can see the results in the video farther down this text. 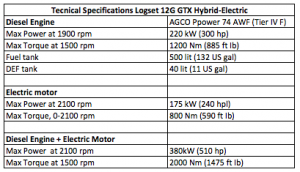 Logset 12H GTE Electric-Hybrid is, according to Logset, the most powerful harvester in the world with 520 Hp. I should add that Gerhard is also part-owner of one of Logset’s two dealers in Sweden, Sigsjö Maskin AB in Sollefteå, and might perhaps therefore have some conflict of interest. 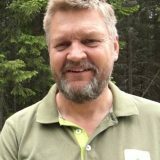 Whatever the case, he has been operating Logset machines, both harvesters and forwarders, for many years and says his involvement with Logset is a good way of ensuring access to good service and after-sales care for a brand he likes but that has little representation in Sweden. The hybrid-electric technology in harvesters is interesting. 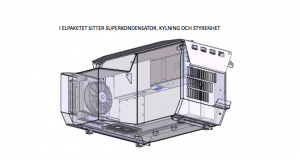 The Swedish company Elforest Technologies (best known for developing a hybrid-electric forwarder some years ago) has presented a hybrid-electric system for harvesters: Elturbo. Ponsse is among the companies that have tested it but as far as I know there are no applications in full operation so far. A harvester’s power requirement typically varies constantly and greatly. 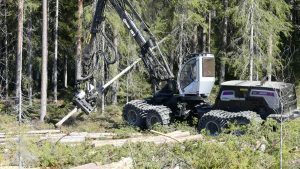 For example, a huge amount of power is needed when the saw unit has to slice through a large-diameter stem or when the crane must lift up a newly sawn through tree from the stump. Or when the machine has to drive up a slope while the operator is simultaneously working flat out with the crane and harvester head. In between, the power requirement can be much lower. Harvesters are also getting ever larger with bigger and bigger engines, and this increases fuel consumption. 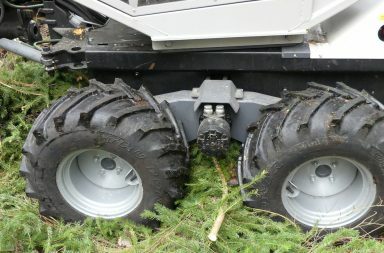 The hybrid-electric system in Logset’s harvesters has no batteries. Instead, it is equipped with a supercapacitor, which is charged by a separate generator. The capacitor can only store electricity sufficient for nine (9) seconds’ operation of the electric engine, but that is enough to give a boost during the brief cycles when extra power is needed. As soon as the power requirement lessens, the hybrid-electric unit reverts to recharging the capacitor. That is recharged as quickly as it was discharged, so after just over 10 seconds it is ready to contribute more power again. The electric engine can contribute a full 175 kW (more than 200 hp) of extra power! 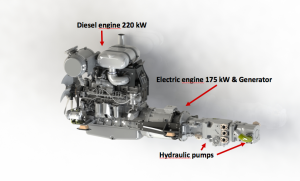 Here is the power package of the Logset 12H GTE Electric-Hybrid harvester: Diesel engine, electric unit with generator, electric engine, capacitor and the hydraulic pumps. The mid section of the hood of Logset 12H Harvester contains the electric unit which is a closed system. 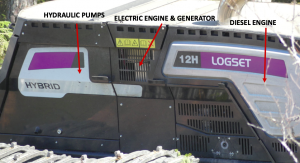 If we examine the Logset harvester’s design, an electric unit sits in the center of the engine unit. There under the hood is the electric engine/generator “package”, which is mounted between the diesel engine and the hydraulic pumps. It sits on the same axle that powers the pumps. The electric unit also includes the supercapacitor, a control unit, and a separate cooling system. 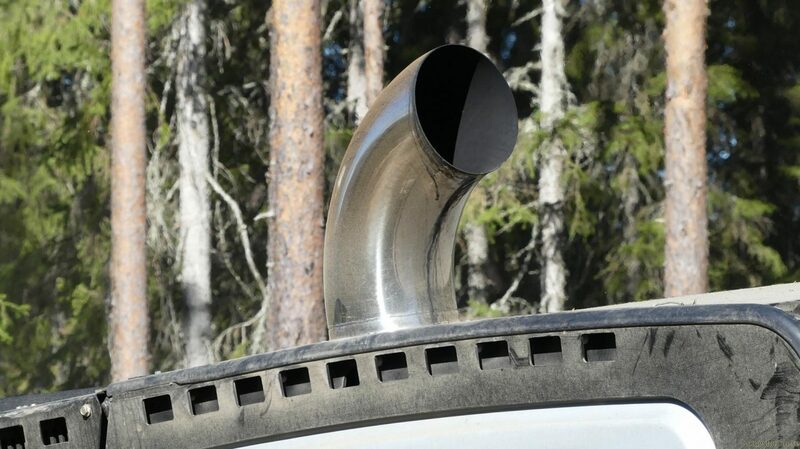 The control unit senses the load on the diesel engine and intervenes quickly as soon as the revs start slowing. If you stand beside the machine and listen, it sounds like the engine is running at the same speed regardless of the load. If you are sitting inside the cab the experience is the same, and it is impossible to sense when the electric engine is working or not. The only way to tell is by looking at a gauge on the harvester’s computer. The difference in power is great when both the diesel engine and the electric engine are running: from 220 kW with only the diesel engine to 380 kW (510 hp) when the electric engine kicks in. 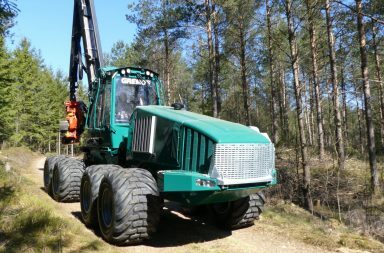 Gerhard says the engine supplies considerably more power when it is needed, and that it also creates a better work environment for the operator. Using the hybrid-electric harvester is less tiring. 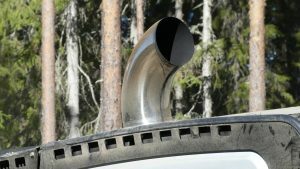 Higher production or lower fuel consumption? Gerhard has been operating the hybrid-electric harvester since the beginning of December 2016 and also has a regular Logset 8H he can compare it with. He says the 12H hybrid produces 25-30% more wood per month with the same fuel consumption and the same operator as the 8H harvester. Calculating in terms of cubic meters, 20-25% less fuel is used, and these figures are for fairly small-diameter trees. He says the average annual stem volume is about 0.22-0.23 cubic meters measured under bark (the common unit used in Sweden to measure logs). The electric engine kicks in when more power is needed for the saw unit. I asked Gerhard how the machine has functioned during this period and what if any problems have arisen. He said the machine has worked just fine. He has replaced a few hoses on the crane but they were “user caused” he said. He added that there were initial problems on the first prototypes, including one machine that was to be demonstrated in southern Sweden in 2016. 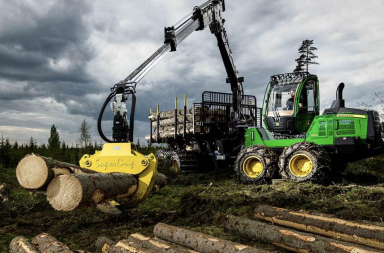 Read more about the Logset 12H GTE hybrid-electric CTL-harvester at Logset’s website here.